Last year I showed that the Thursday before Easter (also known as Holy Thursday) has exhibited a bullish inclination over the years. Today I thought it would be interesting to break out that performance by overnight vs. intraday returns. Intraday returns will be shown here. Overnight returns can be found on Overnight Edges. The study below shows historical performance from open to close on Holy Thursday. Numbers here are solidly bullish, though not as overwhelming as the total numbers would suggest. This is thanks to much of the strength coming the night before. Below is the list of instances. Instances highlighted in purple are the 5 that started with a gap down. All 5 of these gaps were filled at one point during the day, and all 5 instances saw SPY close above where it opened (with 2 of them making for the largest 2 gains of the 19 listed). There are numerous ways to try and take advantage of this information. In general, traders should be aware that Holy Thursday has exhibited seasonal strength, and that strength has often begun to exert itself the night before. For a more detailed breakdown of the overnight returns, check out today’s Overnight Edges blog post. Yesterday was interesting and unusual because it posted an unfilled gap up and a close above the open, but still finished as an inside day. This triggered the below study in the Quantifinder. Implications are somewhat bearish for a 1-day time frame. I also discussed this setup in the subscriber letters over the weekend, because not only did it trigger yesterday, but also it triggered on Friday. Tuesday’s decline was the 3rd down day in a row. Many people are now aware that Fed Days have historically had a bullish tilt. So 3-day selloffs leading up to Fed Days have been quite rare. But they have also been a very bullish setup. 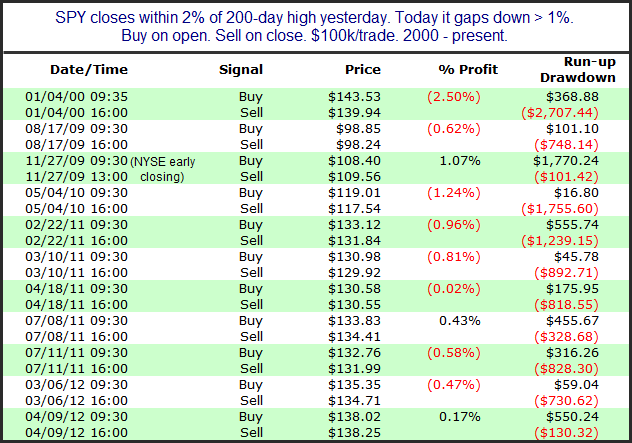 The table below shows the hypothetical results of buying at the close on the day before a Fed Day if it was at least the 3rd consecutive lower close. The exit is 3 days later. 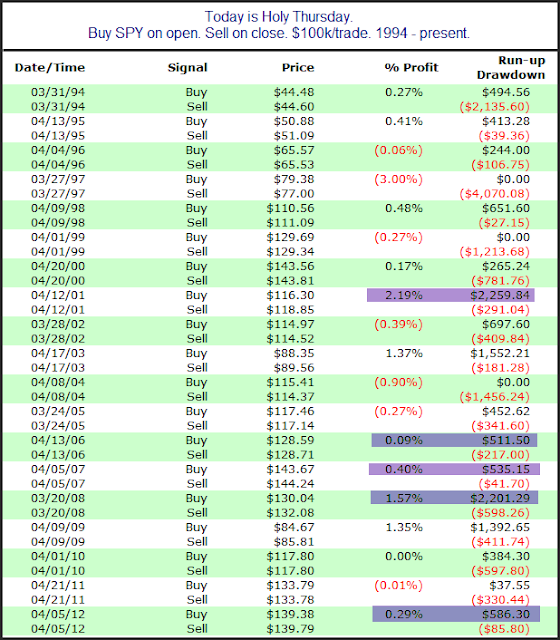 All of the 15 instances saw the market higher 3 days later. These are some very encouraging numbers for the bulls. I do have a concern here. There has only been 1 instance in nearly 15 years. And that took place in 2005. The setup has certainly been potent over a long period of time. But I am much less enthused about it than I would be if all these instances would have taken place over the last 10 years. Still, with an undefeated record I think it is worth consideration. 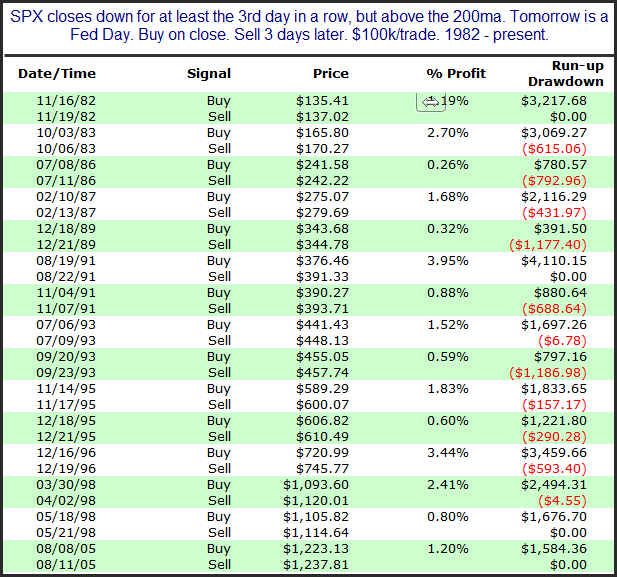 The market had gone quite a while without a pullback before the last 2 days. Monday, for the 1st time in a while, SPY closed at a 5-day low. The study below looks at at other instances of SPY closing at a 5-day low after going at least 2 weeks without one. Results here suggest a decent upside edge. It looks like we should see some strong action on Monday. News out of Cyprus has S&P futures down about 1.5% as I type this late at night. I decided to look back at other times that SPY was trading near a 200-day high and then gapped down over 1% overnight. There have not been a whole lot of instances, but early indications suggest there could be more selling after the open. Below is a list of all the instances. November 2009 was the only instance that put in much of a gain. And even that one failed to fill it gap at any point during the day. None of the others even bounced back as much as 0.6% on an intraday basis. If the market does open as weak as it appears it may at this point, then chances of a strong upside reversal don't appear very good. The study below looks at times the market closed at a high level just before options expiration. I last showed it on the blog last June. It generally has been a bad time for an overbought market. The numbers here are fairly compelling and suggestive of a possible downside edge over the next week. I’ve often spoke in the past of the importance of putting smaller patterns into proper context based on larger patterns or trends. In Sunday night’s Gold & Silver Subscriber Letters I showed some studies that exemplified this concept nicely. The studies looked at the possible impact of 5 consecutive days of SPY making an intraday high. (This triggered at the close on Friday.) I broke it down to see all times the 5 higher highs were accompanied by a 50-day high versus times they weren’t. First let’s look at times where 5 higher highs occurred without a 50-day high. Stats over the 1st few days suggest a possible downside edge. After 5 higher highs the market will often need a breather. But what of times (like Friday) when a strong uptrend exists and the market is also making a 50-day high? Those stats can be found below. Interestingly, the number of instances was exactly the same. But with an intermediate-term rally also occurring the tendency to pull back no longer exists. So 5 higher highs do not appear to suggest a bearish edge in situations like the one that set up a few days ago. There is a possible seasonal influence that could have a bullish impact on the market this week. Op-ex week in general is pretty bullish. March, April, October, and December it has been especially so. 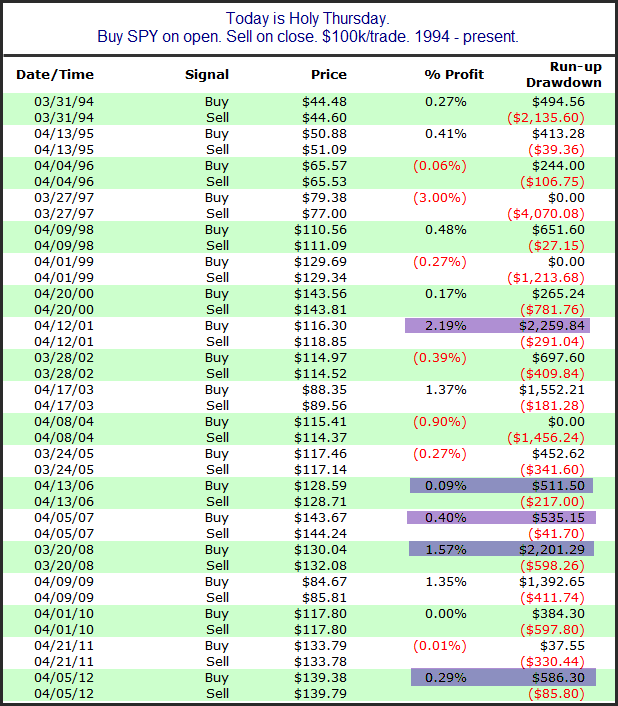 S&P 500 options began trading in mid-1983. The table below is one I have showed on the blog the last few years in March. It goes back to 1984 and shows op-ex week performance broken down by month. All statistics are updated. While December has been more reliable, total gains have been the largest during April and then March op-ex. I am just about finished with Howard Bandy’s new book, “MeanReversion Trading Systems – Practical Methods for Swing Trading”. While I very rarely review books here on Quantifiable Edges, this one really stands out and deserves some attention. Howard goes through every step of the systems-building process. He examines several different oscillators. He scrutinizes entry & exits techniques. He discusses risk control. And on top of it all, he provides code for everything he covers in the book. It is $50 for the book, which is a ridiculously low price. There are trading courses that cost many thousands of dollars that don’t provide as much good information as Howard’s “Mean Reversion Trading Systems”. All of the coding is done in Amibroker, which unfortunately I do not use. But since he lists it all out, those who use other programs like me can translate it into Tradestation, R, or whatever. And here is the kicker for anyone that does use Amibroker – Howard has actually set up a web page where book purchasers can download the code at no additional cost. I commend Howard on his efforts. If you have an interest in developing your own trading systems, this book is a wonderful resource that I would highly recommend. After the big reversal down last Monday the market has recovered quite a bit. What is interesting though is that it has closed within the range of that 1 bar every day for the last week. The bears failed to follow through on that selloff, but the bulls have not managed to move the SPX back out of the range either. This triggered the study below, which I last discussed a couple of years ago. Over the last 24 years or so the SPX has burst higher out of this “failed selloff” and consolidation on a fairly consistent basis. But the implications are only bullish for a few short days. After that there does not appear to be a decided edge for either the bulls or the bears. I have a bit of a concern, though. Technically, the current setup does qualify. But the last 5 days have been a fairly nice rally. SPX just barely has missed breaking out of the range, and it has not “felt” like a 5-day consolidation. So while the study suggests a likely pop higher in the next few days, the likelihood may not be quite as strong as suggested.